A Happy New Year 2019 to you, wishing you a year of creativity and full self-expression in the arts and anything you do! 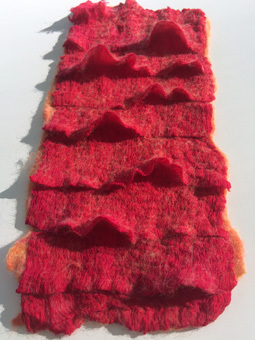 This spring I am holding workshops in my current studio on Cudmore Road and in Ganges, at ArtSpring, where you have lots of space for your projects. 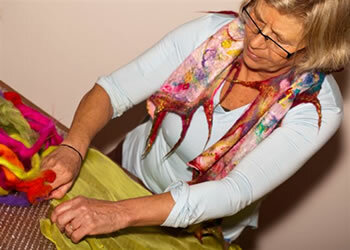 Classes for each workshop are small, a maximum of three persons in my studio (lucky You!) and no more than eight participants in the Artspring Gallery space. 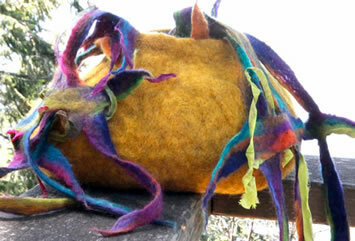 You will receive lots of attention and support for each of your creations in both set ups. Since I am renting the workshop space at Artspring, I need to ask you to sign up as much in advance as possible to assure that the workshop is going to take place. Thank you for your cooperation. All class fees include coffee, tea and goodies. You can register by phone, 250-537-1723, or by email. Please note that you can transfer funds via PayPal (ulrieke@ulriekebenner.com) or send an e-transfer to ulrieke@ulriekebenner.com. Please call me with any questions you may have. If you prefer, you can leave your car at home, and stay directly in Ganges and walk to the classes. I offer to pick you up from any of the 3 BC-Ferry terminals on the island! A material list and workshop location will be sent to you after sign up. 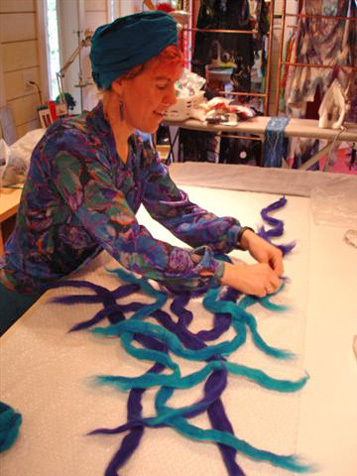 Join me in this innovative workshop and create your unique piece(s) of wearable art. 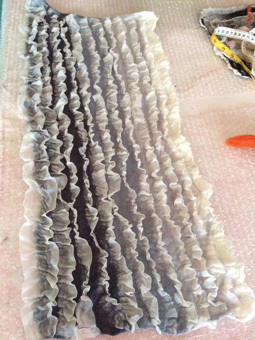 We will use two different layers of transparent silk fabric and encase them with fine wisps of merino wool and other decorative elements in colour or monochromatic. 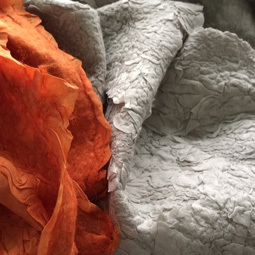 This course invites further exploration in form of piecing and collaging different types of silks for additional texture and surface design. 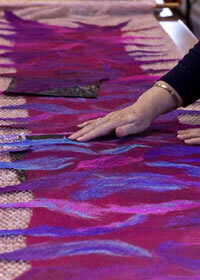 The shawl fabric can be framed with receding layers of silks. I will guide you both technically and artistically through the process. 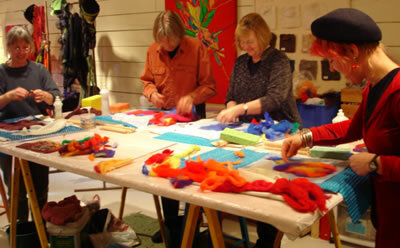 All levels of experience in feltmaking, beginners to advanced, welcome. Coffee, tea and goodies are included. 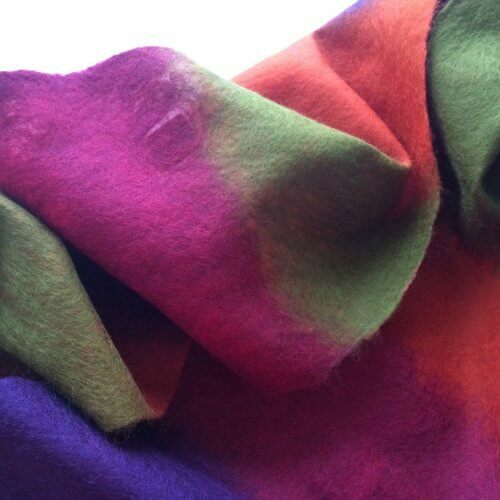 Join me in this innovative workshop that focuses on the dynamics of colour and stripe design in silk and wool. Stripe pattern can be found all around us, in architecture, art, nature, and, of course, in fashion! Stripes are one of the classic forms of design. 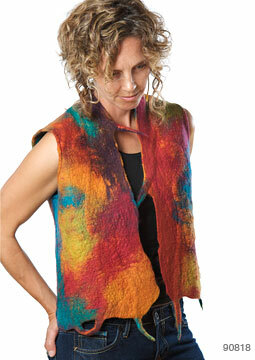 In this workshop we will explore stripe patterns in multiple colours. You will create a shawl, wrap, poncho, or fabric yardage and choose a stripe sequence with broad or fine lines, diagonal or V-shaped rhythmical stripes a la Missoni or a more wavy and irregular stripe pattern. I will guide you through basic design processes for balance in composition and matching colour combinations. 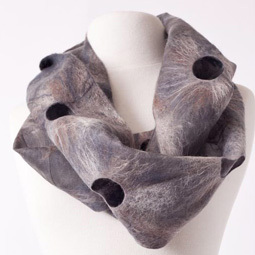 We will use silk and finest merino wool for your personal light weight striped fashion accessory for all seasons. 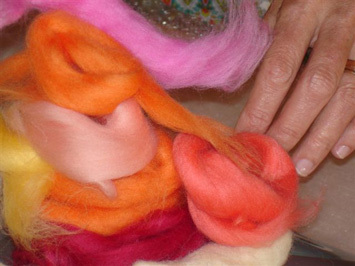 Materials will be an additional cost to the workshop or you might like to bring along your own. Please contact me in advance about your plans. 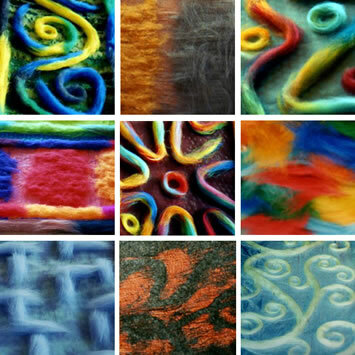 All levels of experience in feltmaking, beginners to advanced, welcome. PRIVATE CUSTOMIZED WORKSHOPS IN MY STUDIO for up to three students, depending on class projects. One or two days, 10.00am - 4.00pm, incl. a light lunch, coffee, tea and goodies. 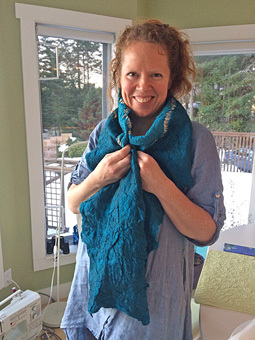 Pamper yourself to a private felting class in the gorgeous setting of my studio on Salt Spring Island. Please inquire about details and reserve your spot. Feel free to inquire about other possible dates for a studio workshop with me that would fit in your travel schedules. P.S. Have Your Bars Run while you are here and book an appointment for a Bars session. Phone 250-537-1723 or email Ulrieke to register. At time of registration a non-refundable deposit of $150 is required. The balance of the workshop fee is due 30 days prior to the first day of the session. You can now transfer funds to us using PayPal (ulrieke@ulriekebenner.com) or send an e-transfer to ulrieke@ulriekebenner.com. 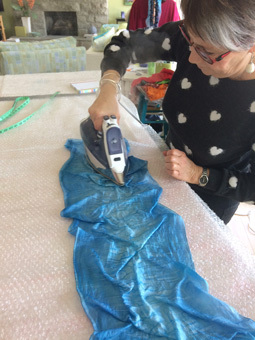 Ulrieke Benner – Art You Wear makes a substantial investment when planning a class, and vacancies can be hard to fill even if there is a waiting list. All workshop deposits are non-refundable. Balance of the workshop fee is due 30 days prior to the start of each course. Cancellations received 30 days or less before the beginning of a class, will be refunded only if we can fill your spot. 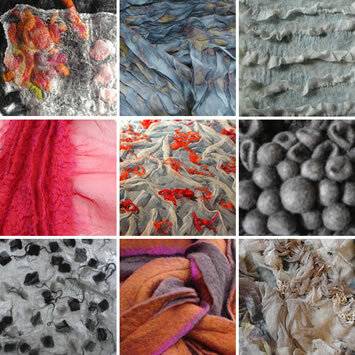 If the workshop is cancelled for any reason by UB – Art You Wear, all fees will be refunded. UB – Art You Wear cannot be responsible for non-refundable travel or accommodation costs.